Colome Junior Teeners defeated Valentine 7-6 in the consolation championship of Winner Father’s Day Tournament on Sunday. In the fifth inning, Joey Cole tied the game at 6-6. Valentine took an early 2-0 lead but Colome came back to tie the game 2-2. Valentine regained the lead before colome came back to score the winning run. 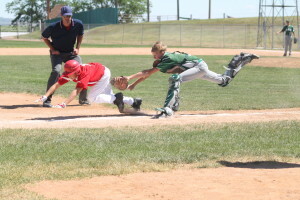 In the first game of the tournament, Platte defeated Colome 13-5 and in the second game Colome won 4-1 over Lyman. This game was called due to rain out.